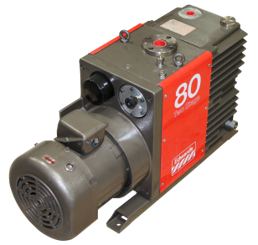 The Edwards E2M275 is a dual stage rotary vane pump commonly used in a wide range of vacuum related industries. It incorporates forced oil lubrication to prevent oil starvation during high gas loads as well as an integrated gas ballast to assist with troublesome applications, such as those with condensable vapor content. Although very uncommon for this size pump, for applications requiring inert fluids (e.g. Oxygen compatibility), the E2M275FX is used, containing PFPE oil instead of a standard hydrocarbon based fluid. Unlike smaller E2M pumps, the E2M275 is water cooled and is commonly configured for the integration of a mechanical blower, such as the Edwards EH2600, which will greatly increase pumping speed. ITF Inlet Dust Filters – installed at the pump inlet to prevent dust particles from accumulating in the pump oil and damaging the pump and its performance. ITO Catchpots – installed at the pump inlet to prevent liquids from accumulating in the pump oil and damaging the pump and its performance. ITC Inlet Chemical Traps – installed at the pump inlet to prevent aggressive vapors from accumulating in the pump oil and damaging the pump and its performance. The Edwards E2M275 has the following specifications.